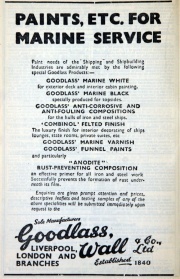 I’m a Melbourne historian seeking contact with anyone with knowledge of the Goodlass Wall Paint Co. (Liverpool). The company set up in the Melbourne suburb of Collingwood around 1915 and continued at the site until the mid 1950s. Around the 1930s or 40s they expanded their enterprise with a new brick factory at the site. I am hoping to gain information concerning this expansion but particularly information concerning the architects used by the company for their overseas constructions. I believe the building concerned was designed by their (Liverpool based? ) English architects. Would anyone have details concerning architects used by the firm or would anyone have copies of financial reports from the 1930s onwards?. I’m sure that photographs of the firm’s overseas holdings must exist somewhere but I have had no luck in locating any information whatsoever. The company was amalgamated some years ago but I have not received any replies from previous inquiries; perhaps someone at the History Forum could advise more fruitful lines of inquiry. All information or suggestions gratefully accepted. Hope you can help me, i have just picked up a small carved wood table and underneath is a plaque reading ‘ St Georges boys industrial school west derby road liverpool’. Do you know if the school is still there?